Styrofoam: Cheap, convenient, and the bane of environmentalists. Americans throw away 2.5 billion foam cups every year, and the damn things just sit in landfills for millennia. Unless, that is, you sic a bunch of hungry mealworms on them. 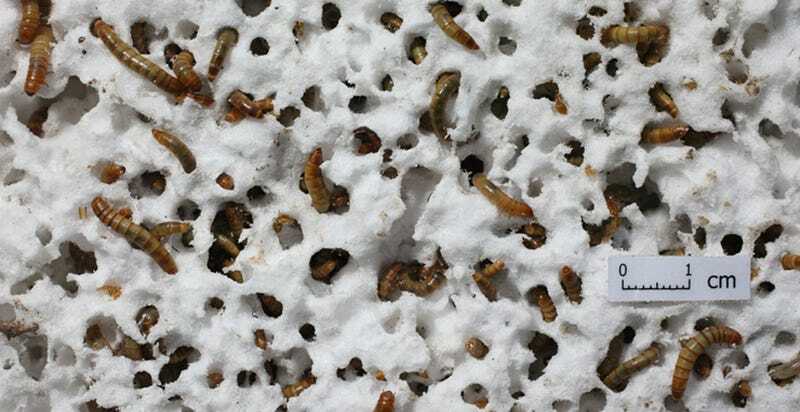 That’s right: Mealworms will happily subsist off a foam diet, turning the environmental scourge into carbon dioxide and poop, according to two new studies authored by researchers at Stanford and China’s Beihang University. The humble mealworm’s secret? A special gut bacteria that secretes plastic-digesting enzymes. Surprising as it may sound, this isn’t the first time we’ve found organisms that can digest some really weird substances. A few years back, a team of researchers at Yale discovered a rainforest fungus capable of breaking down the polyurethane plastics used in everything from foam insulation to Spandex. And let’s not forget the oyster mushroom, an astoundingly useful (and tasty!) fungus that can decompose the tough aromatic hydrocarbons found in petroleum. What’s exciting about the new find is that anything mealworms don’t digest is excreted as biodegraded fragments. In essence, the mealworm digestive tract turns Styrofoam into manure. The researchers now plan to study the foam-degrading gut bacteria more closely and find out whether it’ll eat other environmental menaces, such as microbeads. It’ll probably be a while before this research gets translated into any sort of large-scale environmental clean up effort. But as our ongoing exploration of the microbial world is showing us time and again, the tools to clean up our messes are out there in nature. It’s just a matter of finding them.